Canine companions demonstrate unconditional love, joy, security, compassion, and no judgments of cancer survivors abilities or appearances. The American Cancer Society Bark For Life is an irresistible way to partner with your canine best friend, smile, and make new friends canine & human. Families and their dogs come together for a few hours during the day and complete a one mile walk to honor the care giving qualities of their canine "Best Friends" and cancer survivors. Who can participate in a Bark For Life event? The heart of the Bark For Life is the relationship between survivors and their canine companions. Every family, co-worker, friend, or community member who has been close to a cancer experience and has a dog in their life, is invited to support the American Cancer Society by registering and fundraising through the Bark For Life. Bark sponsorships that involve new businesses and services that cater to dog and pet products. Dog trainers, veterinarians, groomers, breeders, and dog rescue agencies are proud to support the ACS through support of the Bark For Life. 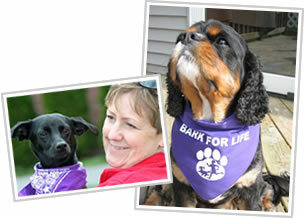 National pet food and supply chains are proud to donate and participate in the Bark For Life. How does Bark For Life benefit Relay For Life and the American Cancer Society? 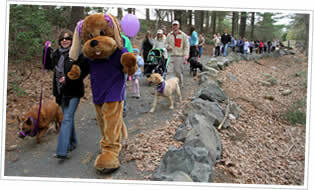 The Bark For Life and the Relay For Life are fundraising events to support the mission of the American Cancer Society. The advantage of the Bark is that we have fun fundraising with our best buddies our dogs! Bark volunteers work with their Relay For Life counterparts to promote both events. Fundraisers can be built into pre or post Relay Barks to bring people to the Relay or to give Relay teams an event to finish off their fundraising. Fundraising donations are credited to the Relay teams through participation at the Bark when they participate in fundraising at the Bark For Life event. A Bark tent site can be set up at the Relay with contests that conclude at the Bark or on the day of the Relay. Dog owners come to the Relay, not the dogs. 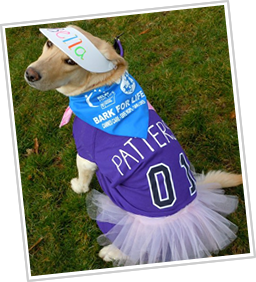 When new Bark participants are invited and attend the Relay, they support their own Bark teams at their Bark tent site and Relay team fundraising throughout the Relay….a new audience for team donations. People are always looking for new ways to socialize with their dogs. After the Bark For Life annual event, fun year round canine fundraising activities keep this audience engaged. There are many survivors who do not have family or friends but have canine caregivers. They may know about Relay but are not comfortable attending. The Bark For Life gives these cancer survivors a chance to participate and be empowered in the fight against cancer.